Located in the North of the city, this small cosmopolitan neighborhood is different from everything else you see in London. 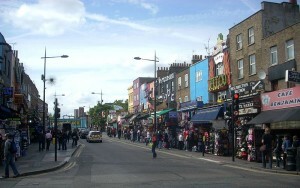 Over the time, Camden Town gathered communities of Irish and Greek Cypriots. Nowadays, here you can find a large community of people who connect something beyond language or ethnicity: punk style, retro, vintage and many other styles. However, everything you see here it’s different and unique. In the neighborhood, you can notice characters with crest and implanted metal in epidermis, tattooed girls with black makeup and intentionally ripped stockings and other interesting looks that make your walk in Camden Town a memorable one. Do not misunderstand because the atmosphere is not tense, on the contrary, it’s really quiet. It’s a place where, no matter how different you are, you do not stand out. The attitude of these people is a fashion and a lifestyle, not a statement of aggression and violence as we might be tempted to believe at a first appearance. The main street is lined by buildings of two floors height and it is pretty crowded during the day. You will find stores that sell the most diverse and strange things from antiques to punk clothing and accessories. Often, the products are displayed on the sidewalk and on the buildings, signs and colorful advertisements informing you that here you can benefit from the best tattoo or piercing services. You never know what to expect at the next corner and even if you did not come for a shopping session, curiosity pushes you to go further. Prices are relatively low and may not be a bad idea to buy souvenirs from here. You can choose diversified things – old, silly, weird. Traveling through Camden delights the eye and mind and also your stomach, and you have to stop to sample traditional foods whose flavors allure you at every step. You will definitely notice the Cyber Shop in Camden, a store with loud music and bass that make you vibrate with dancers hanging from the ceiling and fluorescent lights. Also, you can do a cruise on the Regent Canal, a waterway that crosses the neighborhood area. From Camden, you can easily get to the airport by taking a taxi to Stansted. Otherwise, if you travel from the airport to this beautiful borough, you have a couple of options that we have listed in the following paragraphs. In order to get rail transport from London Stansted Airport to Camden (NW1) you have to take the train to Tottenham Hale Underground Station, the Tube to Highbury and Islington and from there the train to Camden Road. There are also other transfer options such as using a taxi service from Stansted Airport or Tottenham Hale Underground to Camden (NW1). So as to travel by car from London Stansted Airport to Camden (NW1), you must use the M11 motorway. London Stansted Airport is 43.6 miles away from Camden (NW1). A journey by taxi from Stansted Airport to Camden (NW1) with 247 Stansted Airport Transfer is going to last around 1 hour and 30 minutes. The price for a Stansted Taxi to Camden (NW1) starts from 55 GBP for a saloon car.